Chelsea tactician Maurizio Sarri has revealed that he won’t be resting midfielder Jorginho due to unavailability of replacement in the side. The Italian midfielder has been a regular fixture for Chelsea in the current football season, as he has started all but one game in the Premier League. Jorginho missed the game against Wolves due to suspension but have managed to rake 25 appearances in all competition. Cesc Fabregas left the club for Monaco last week leaving Sarri as the only natural playmaker in the side. Though the London club are in talks with Zenits Saint Petersburg player Paredes, the 27yr old will have to continue in the role. 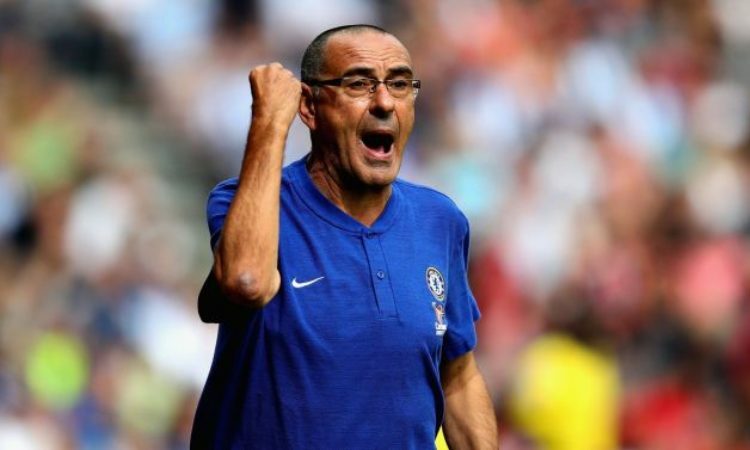 “We are not ready to change at the moment,” Sarri said. “I can change when we are at 100 per cent in what I want to see. If [using] a 4-3-3 we are at the top, we can try to change. But not at the moment. “It’s very difficult to say a percentage but, in England, it’s very difficult to arrive at the top because this one was the first week without three matches since August. “Jorginho has played with me for four seasons. It’s very difficult for him to improve more. He played very well for 20 matches, I think. “Now, maybe, in the last two matches he was a little bit tired. He moved the ball a little bit slowly than before. But I think that it’s normal.